"He seemed to be grazing quite peacefully in the fully flooded waters. What could go wrong?" A family wanted to get close to exotic wildlife, so they decided to take a trip to Africa — and they really couldn't have gotten any closer than they did on the Chobe River in Botswana. 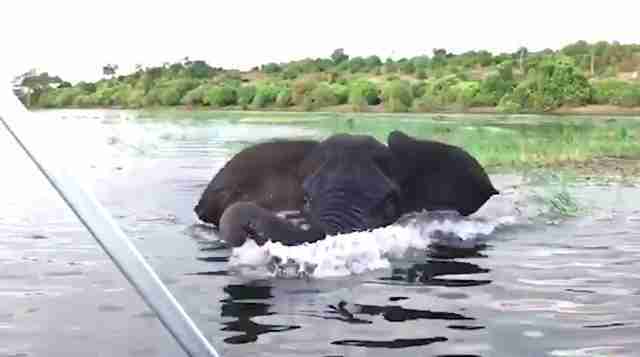 The family was taking a guided boat tour when they spotted a wild elephant in the water, peacefully rummaging through some floating weeds. Su-An Marais couldn't resist capturing the idyllic moment: She took out her phone and started recording. That's when the elephant suddenly turned and looked directly at them. While many people know that elephants are complex, emotional creatures who "never forget," it's perhaps a lesser-known fact that the animals, despite weighing several tons, are also quite capable swimmers — which is what the Marais family found out the hard way. In a few swift strokes the elephant was right next to the boat where the camera-pointing humans were. 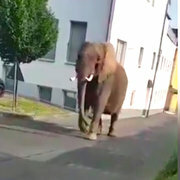 Even though the guide had turned the engine off so as to not disturb him, the elephant clearly did not seem to appreciate the breach of his space — and he made this clear. 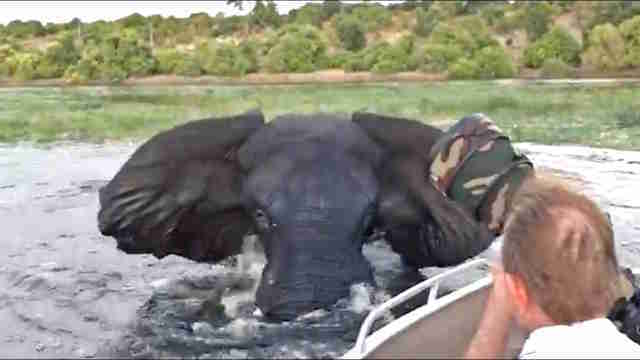 The phone footage suddenly jolts as the elephant goes ahead and gives the boat a few strong shoves back in the direction it had come from. The family got what they came for — they got close to the animals they love. But they also got schooled by one. "Clearly we were too close for comfort,” Marais said.